In many instances, we get referred to a program or to the faculty as ‘good’ applicants for residency positions. This recommendation can come from our colleagues or even our relations who can vouch for the kind of person we are. The referral once made has to be followed up by personal correspondence from the applicants themselves as it shows interest in the program. One big mistake folks often do is not follow through. The connection or contact that is working for you – makes the recommendation in person or phone or by email and then you do not finish the procedure with a follow up email. In this case, the process stalls and is left in many cases at that, leaving us wondering what ever happened to your connection. A good time to do a follow up correspondence is within week or two after the contact has vouched for you. This will allow for a little time in between and make you not look too eager. The email itself need not be very lengthy and certainly should not be prosaic. Every chance you get when you initiate correspondence is a chance to make a positive impression on the recipient. This should reflect in your writing as well. The emails should be well thought out and have a structure which suggests a beginning and a definite end. This is pretty much applicable to all the correspondence you have with the programs. An example of a sample email you can use in this situation is given below. Be careful to not use the email verbatim as search engines index pages and web content. It would look very poorly if you copy paste the email and used it for your own as is. Appearing lazy and uncreative is the last thing you want to do for residency interview. You can change things around and use the template below to construct an email that uniquely reflects you and the program under consideration. 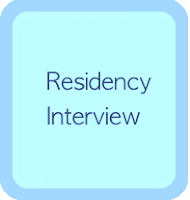 I write to you regarding the interview for residency position at University of ___. I have known Mr./Mrs./Dr. __ (person recommending you) for __ years. In my capacity as __ (friend, coworker, relation), they are certainly in a good position to comment on me as a person. I recognize that sometimes a personal word or strong support from a person one knows can be as important as other aspects of the CV. In addition to the personal recommendation, I would also encourage you to look at my complete application profile and then decide if you think I would be a good fit for the program.